Grab your butternut squash and pumpkin gourds, get cozy and turn on your favorite spooky movie! 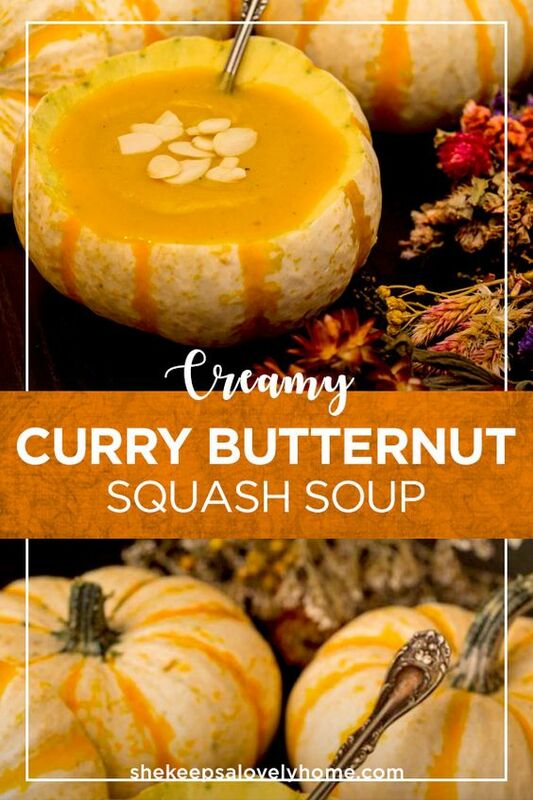 It’s time to make Roasted Curry Butternut Squash Soup! Nothing says Fall like butternut squash soup, and the second the pumpkin gourds hit the farmer’s markets, I dive into the bins and boxes like a fox down a rabbit hole! 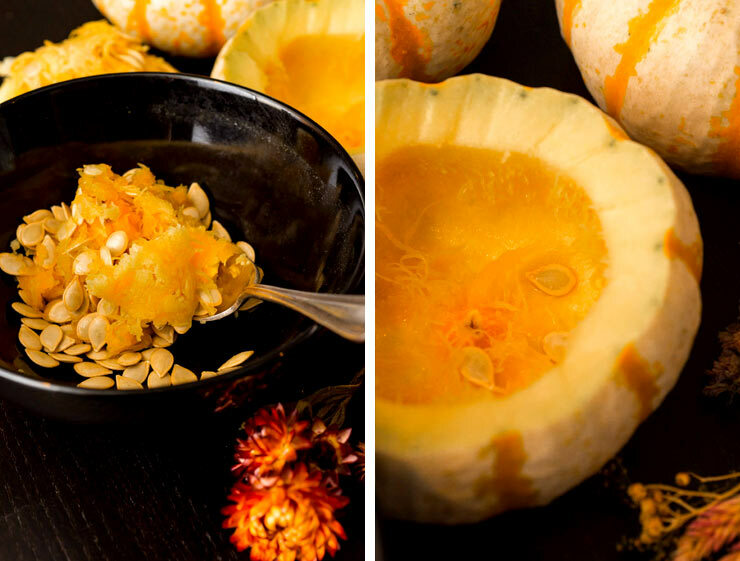 Just look at how much fun you can have when you turn pumpkin gourds into pretty little bowls for your soups!! Oh great pumpkin goodness, they’re just so pretty! All you have to do is carefully cut around them, de-seed them and give them a little rinse before you add your soup. 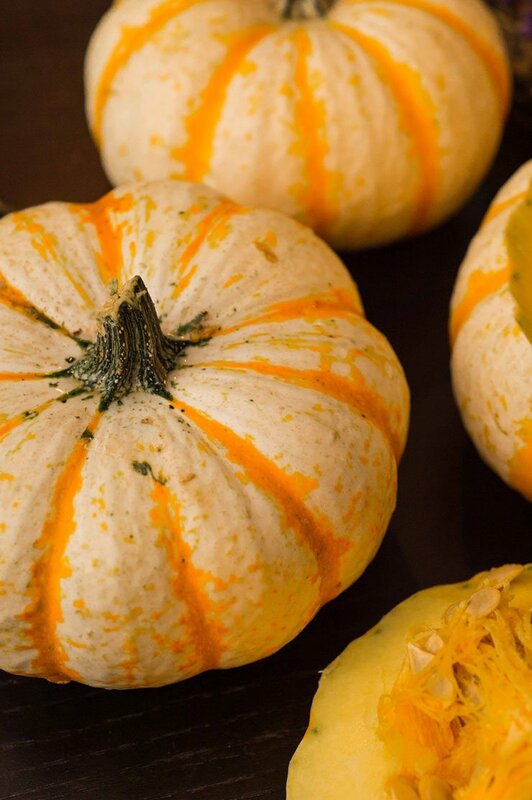 I use pumpkin gourds for everything from spinach dip to olive tapenade on Halloween cocktail party tables. You can serve tasty hot soups in them with the little tops to keep them warm until all of your guests get to their seats. Oh! It’s just so nice! 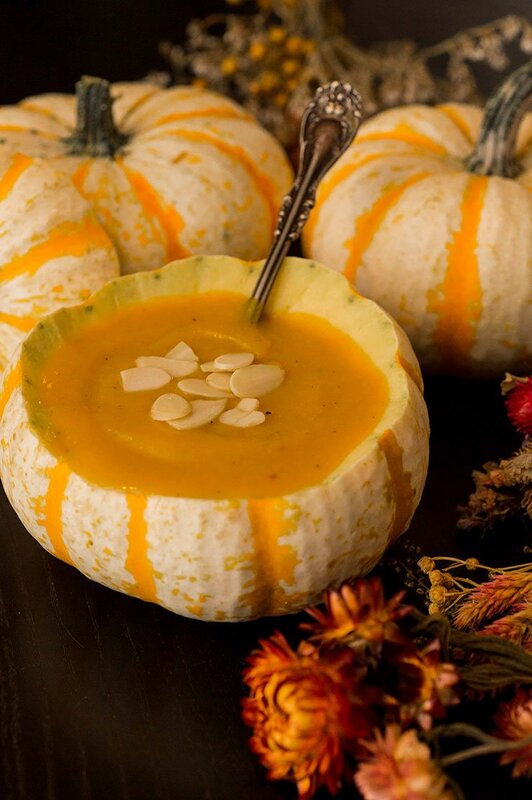 OK, enough about the pumpkin gourd bowls – let’s talk butternut squash soup! This soup is dreamily creamy, full of flavors that don’t overpower the butternut squash, but do give it more dimension than a classic recipe. Definitely a first course that will impress any dinner party guests. You can make it spicier by adding more cheyenne, but don’t go toooooo spicy. 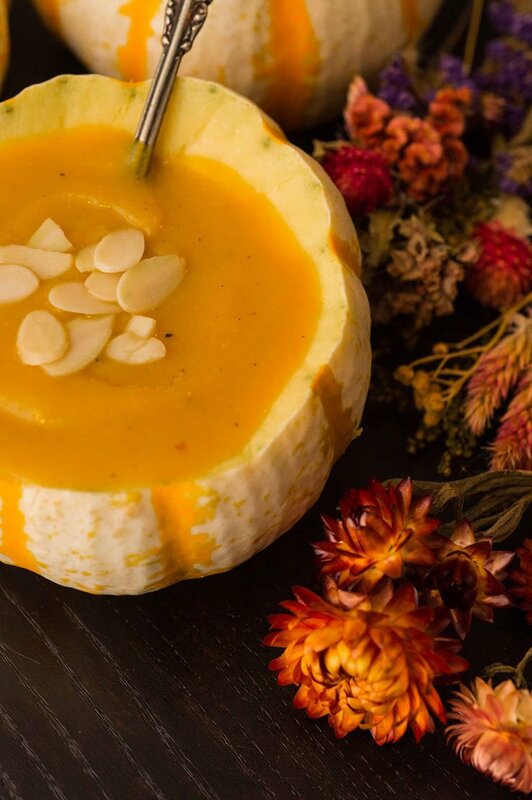 You really do want the butternut squash to be the star of the show. You can also easily make this recipe vegan by substituting the chicken broth with vegetable broth and omitting the butter. You’ll require a medium size mixing bowl, blender or immersion blender and a pot that can hold at least 2 quarts. 2 tbsp. butter - ideally use Kerrygold. I eat it with a spoon, it’s so good! A teeny dash of cinnamon. Cut your butternut squash carefully in half, seed and drizzle with olive oil. Make sure both halves are coated nicely. Line a baking sheet with tinfoil, place them face down and bake for 45 minutes. 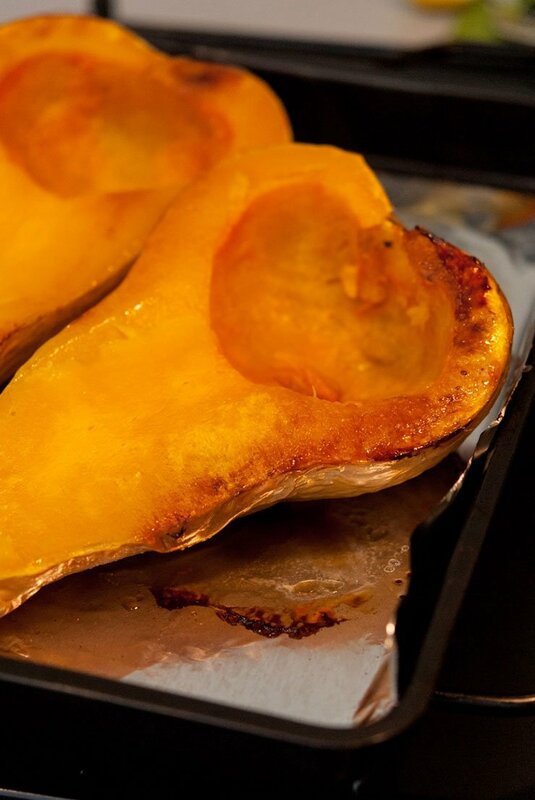 Once the squash is fully cooked, remove and let sit until cool enough to handle – about 15 minutes. Once cool, scoop the squash out of the hard skin into a bowl. Discard the skin. Set aside. Chop your red onion and add it to a pot with 1 tablespoon of olive oil. Cook onion until it’s just beginning to brown, then add garlic. Cook garlic and onion together until both are nicely brown. Between 5-8 minutes. 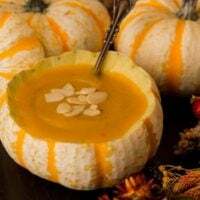 Add the cooked butternut squash, brown sugar, butter, celery salt, nutmeg, cheyenne pepper, curry and a few good shakes of fresh black pepper to your pot and give it all a little mix with a wooden spoon. Add 4 cups of chicken broth and gently stir. Let simmer for 15-20 minutes. Turn off heat and blend with your blender until smooth and creamy. Taste and add more salt or spices as necessary. Add your butternut squash to the blender, then add your cooked onions and garlic, brown sugar, butter, celery salt, nutmeg, cheyenne pepper, curry and a few good shakes of fresh black pepper. Carefully pour in your chicken broth as high as it will go without overflowing your blender. Blend until smooth. Pour back into your pot, add the remaining chicken broth and let simmer for 15-20 minutes. Stirring occasionally. Taste and add more salt and spices as necessary. Some like their soup more salty, some like it more spicy. 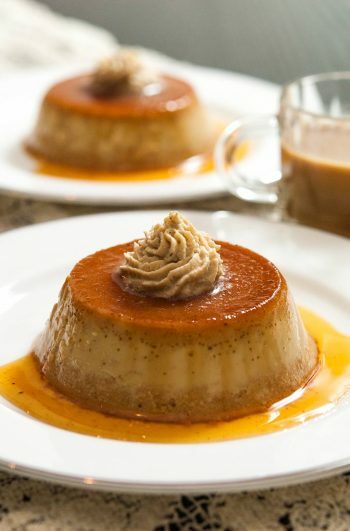 Serve immediately, or keep in the fridge for up to a week. You can also freeze it and it’s perfectly tasty when reheated! You’ll notice that this recipe is a touch under-salted. Since butternut squashes can really vary in size, it’s best to start with only a tea spoon, then add more, little by little until it’s perfect.